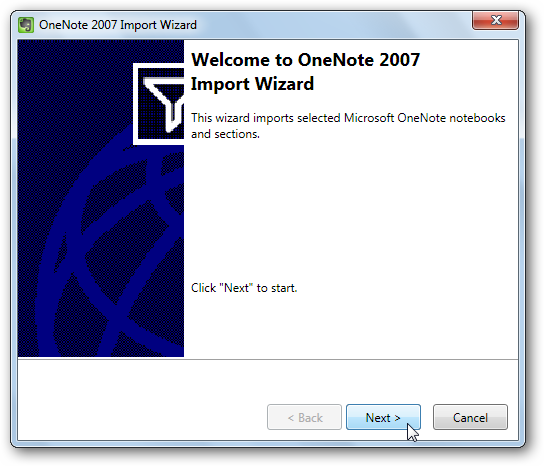 Would you like to import your notes from OneNote 2007 into Evernote? 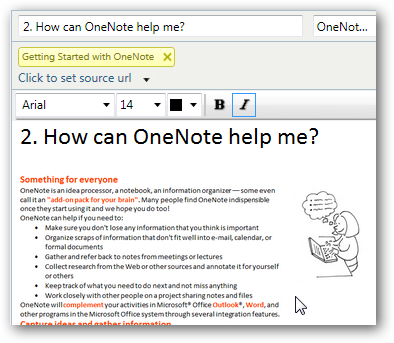 Here’s how you can do it without losing any of your existing data in OneNote. Evernote is an increasingly popular note taking application that helps you keep all of your notes, pictures, and even files together on all of your devices. You can use Evernote on your Windows or Mac computer, with the Evernote Web app, or on a wide variety of mobile devices. All notes are automatically synchronized between all of the devices, so it’s very easy to keep up with your information. OneNote is another great note taking application that contains many more editing and formatting options than Evernote, but sadly is not available on as many devices. Additionally, syncing data between OneNote and the cloud is difficult, and only works with the latest 2010 version. If you’ve used OneNote 2007 for years but are now considering switching to Evernote, here’s how you can make the switch easy and take your notes and memories with you! 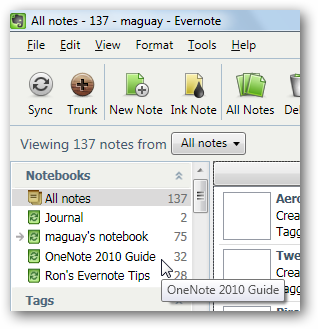 It’s fairly easy to import your OneNote 2007 notes into Evernote. 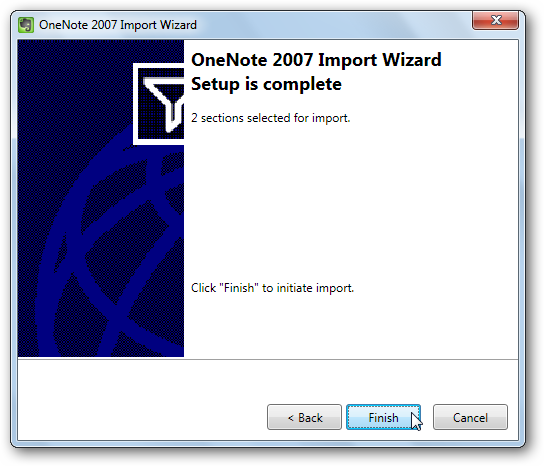 Open Evernote, click Import in the file menu, and the select Microsoft OneNote 2007. If you’re using a different version of OneNote, you won’t be able to import your files into Evernote. However, there are workaround ways to import files from most programs into Evernote, so check back soon for an upcoming article on importing OneNote 2010 files into Evernote. If OneNote 2007 is installed, you should see a window as below. Click Next to get started. 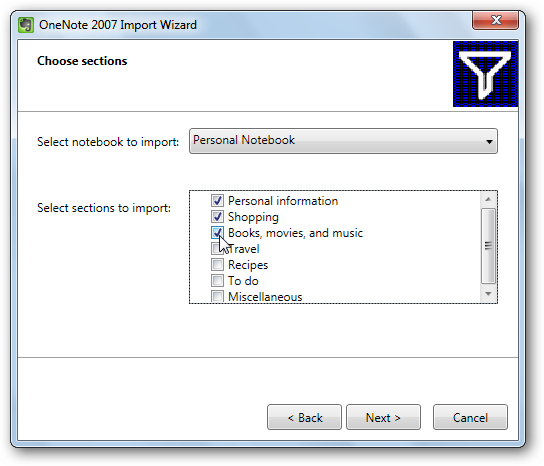 The Import Wizard will show a list of your available OneNote notebooks from the top menu. Select the notebook you wish to import, and then select the sections from the notebook you want to import below. Unfortunately, there is not an option to import all of your notebooks at once; you have to select the notebooks and sections individually. Once you’ve made your selections, click Next. Note: If you want to import all of your OneNote 2007 notebooks, simply repeat these steps when you’re done to import the other notebooks. Evernote will show you how many sections you’ve selected; click Finish to start the import process. Evernote may take a few minutes to import your notes, depending on how many notes you’ve imported. Once it’s finished, you’ll see a confirmation letting you know the data was imported. Note that by default, imported notebooks will be saved only on your local computer. 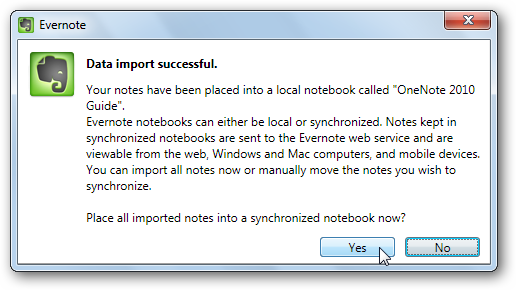 If you’d like your imported OneNote notebooks to be synced with Evernote Web and other computers or devices you own, click Yes to convert the notebook to a synced notebook. You will likely want to do this, as synchronization is one of Evernote’s best features. Evernote only lets you upload 40MB of data per month for free, or 500Mb per month if you’re on a pro account. If you’re close to the limit on your monthly usage or want to import a large amount of data from OneNote, you may want to leave the notebook offline and sync next month. Now, you’ll see your imported notebooks under their notebook name in the list on the left side. Select it to view all of your imported notes. Each page in your notes will have been imported as an individual Evernote note, but it will be tagged with the section’s name. Most items in your notes will be imported correctly, including images, outlines, and text notes. Usually your text notes will be kept separate from your image notes; however, if your OneNote note had images inline with your text, Evernote will import the entire note as an image. You will still be able to search for text in the note using Evernote’s OCR capabilities, but you will not be able to edit or copy text from the note. If you still need access to the original text and images, you may want to copy them manually from OneNote. No matter what application your prefer, you should always be able to take your notes and data wherever you want. 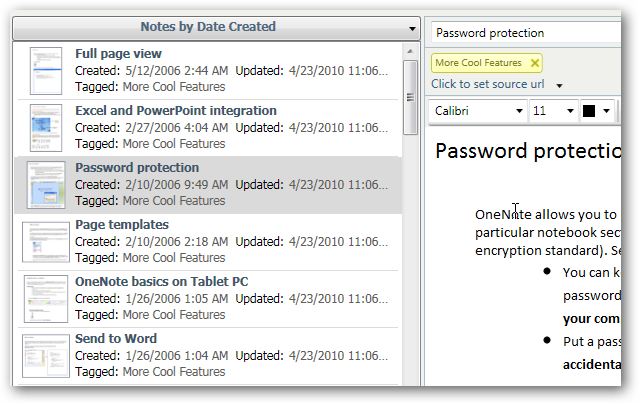 Now, even if you have years of notes stored in OneNote 2007, you can easily transfer them to Evernote. Even if you prefer OneNote’s features and interface, this could be a way you could take your notes on your mobile device, as Evernote supports far more devices than OneNote. If you’d like more ways to use Evernote to organize your life and help you remember everything, check out our article on Remembering Everything You See Online With Evernote for Chrome. Or, if you’re just getting started with Evernote, check out our article on How to Manage and Organize Notes With Evernote.